Delaware has a long history with the iron horse despite never containing more than 300+ route miles of railroad. 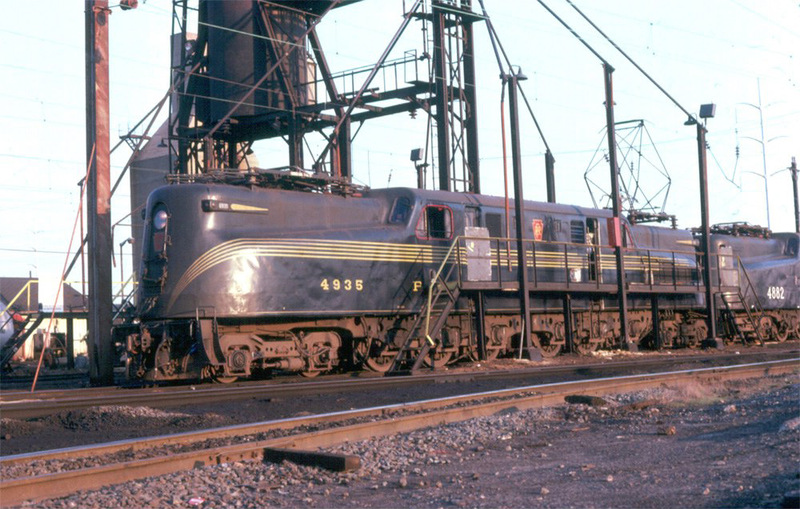 During the industry's "Golden Age," the Pennsylvania Railroad was the predominant provider, ranging from its electrified Northeast Corridor in the north to its Delmarva Peninsula lines penetrating south through Dover, the eastern shore of Maryland, and terminating at Cape Charles, Virginia. From there, the PRR even provided car ferry service across the Chesapeake Bay to Norfolk, Virginia. The Delmarva trackage was not only a single main line; it also contained numerous branches serving such places as Rehoboth Beach in Delaware and other points throughout the Old Line State such as Ocean City, Cambridge, Oxford, Chestertown, and Centreville. These secondary corridors primarily served agricultural interests and seafood companies. But the PRR wasn't the state's only railroad; the Reading reached Wilmington and the Baltimore & Ohio's main line to Philadelphia roughly paralleled the PRR's slightly to the north. Today, the state is home to a few small museums as well as the Wilmington & Western, a popular tourist attraction. According to an in-depth analysis Trains Magazine published in its January, 2007 issue entitled, "Great Railroading: State-By-State," railroads in Delaware got their start with the New Castle & Frenchtown Railroad, a system which first opened on February 28, 1832. Its heritage actually predates American railroads by more than two decades when the New-Castle & Frenchtown Turnpike Company was chartered on January 24, 1809 to link New Castle with Frenchtown, Maryland along the Chesapeake Bay. The turnpike was fully opened by 1816. By the late 1820's the two states had authorized the turnpike's removal in favor of a railroad. What resulted was separate companies formed in their respective states; the New-Castle & French Town Turnpike & Rail Road Company (Maryland) and the New Castle Turnpike & Railroad Company (Delaware). They merged on March 31, 1830 to form the New Castle & Frenchtown Turnpike & Rail Road Company. It was ready for service by 1831; initially utilizing horse power, within a year the railroad had switched to steam locomotives. Since Delaware lay between the major cities of Baltimore and Philadelphia, it wasn't long before competing railroads were crossing its borders. Independent for less than 10 years, the New Castle & Frenchtown (NC&F) was acquired by the Philadelphia, Wilmington & Baltimore (PW&B) on March 15, 1839. The PW&B blossomed into a strategic system linking its namesake cities. As a result, the Baltimore & Ohio and Pennsylvania Railroads fought for its control with the latter eventually proving the victor. The NC&F was subsequently deemed largely redundant and abandoned west of Porter Road, Delaware in 1859. Surprisingly, the east end remained in use under the PRR for access to its Delmarva Peninsula trackage. This segment still remains in service today. Delaware's other major player was the Baltimore & Ohio. According to the book, "Baltimore & Ohio Railroad," by Kirk Reynolds and David Oroszi after the PRR outbid it for control of the PW&B in 1881 it did not give up. To continue accessing Philadelphia, and other points throughout the Northeast, it acquired the Delaware Western Railroad's charter. Following a few years of construction it was completed between Philadelphia and Baltimore (111 miles) in September of 1886, roughly paralleling the PW&B along the way. The B&O regained access to the New York City region, previously enjoyed via PRR trackage rights, after an agreement was reached with the Philadelphia & Reading (P&R or Reading) between Philadelphia and Bound Brook, New Jersey. Beyond the latter city the Central Railroad of New Jersey was utilized as far as its Communipaw Terminal in Jersey City. From there, ferries provided passengers access into downtown Manhattan. The previously-mentioned Reading Railroad (pronounced "Redding") was the only other major system to serve Delaware. The company's network was predominantly located in central and eastern Pennsylvania thanks to a web of branch lines serving a multitude of anthracite coal mines. During the 19th century the P&R was one of the most successful railroads in the country. Alas, as the use of this clean burning coal declined during the 20th century its fortunes ebbed as well. The Reading reached Delaware by way of its so-called, 90-mile "Wilmington Northern Division" which branched southeasterly from Birdsboro, Pennsylvania. It was built as the Wilmington & Brandywine Railroad, chartered on March 5, 1861 for the purpose of serving various industries between the two points. On May 29, 1866 it merged with the Berks & Chester Railroad to form the Wilmington & Reading Railroad. The line from Reading/Birdsboro to Wilmington was finished in 1870. After entering bankruptcy in 1876 it was reorganized as the Wilmington & Northern Railroad on April 3, 1877 and later leased by the P&R on February 1, 1900. This museum is maintained by the Felton Community Historical Society inside the town's preserved, single-story brick depot that was completed around 1868 by the Delaware Railroad, a future component of the Pennsylvania Railroad. It was added the National Register of Historic Places on July 13, 1981 and trains to continue to rumble past the building today. Its opening hours are unknown. 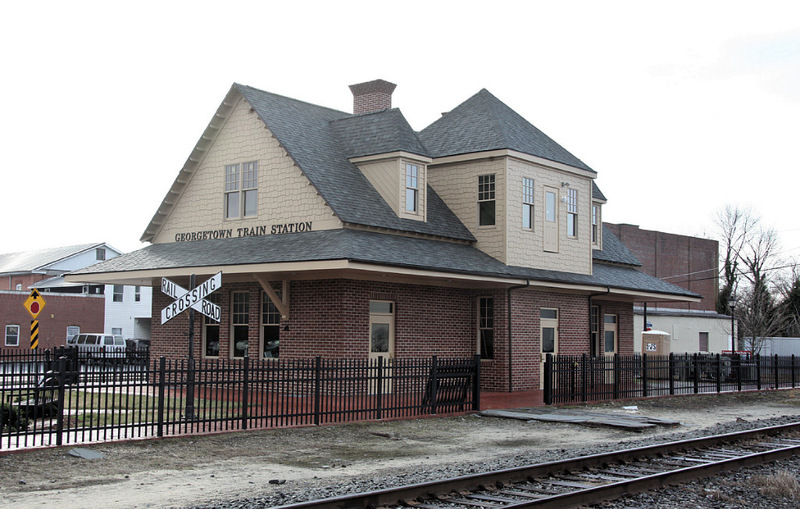 This museum, led by the Harrington Historical Society, is located in Harrington, in the south-central part of the state along the former PRR's Delmarva Peninsula Lines. The term Delmarva is a combination of state names Delaware, Maryland, and Virginia which occupy the peninsula immediately east of the Chesapeake Bay. Mike Schafer and Brian Solomon's book, "Pennsylvania Railroad," notes that PRR's then-Vice President, A.J. Cassatt (who was later famous for landing the railroad in downtown Manhattan and constructing the breathtaking Pennsylvania Station) conceived the idea of forming the New York, Philadelphia & Norfolk Railroad. Its purpose was to control or construct all rail lines along the peninsula to serve agricultural interests, seafood companies, and the naval/commercial port of Norfolk, Virginia. The task was largely complete by 1884 and the NYP&N was merged into the PRR during the 1920's. The preserved interlocking tower in Harrington, the heart of the museum complex, was opened in 1920. Also be sure and visit a preserved PRR caboose on display. This tourist line has grown into a popular attraction since it first began in 1966 on a former Baltimore & Ohio branch. Today it operates 10.2 miles between Wilmington and Hockessin and continues to pull trains with steam locomotives. The history of railroading in the Red Clay Valley begins with the chartering of the original Wilmington & Western Railroad in 1867, intended to push rails along the creek and handle freight to the Port of Wilmington. After only five years of construction the line was opened between Wilmington and Landenberg, Pennsylvania on October 19, 1872. 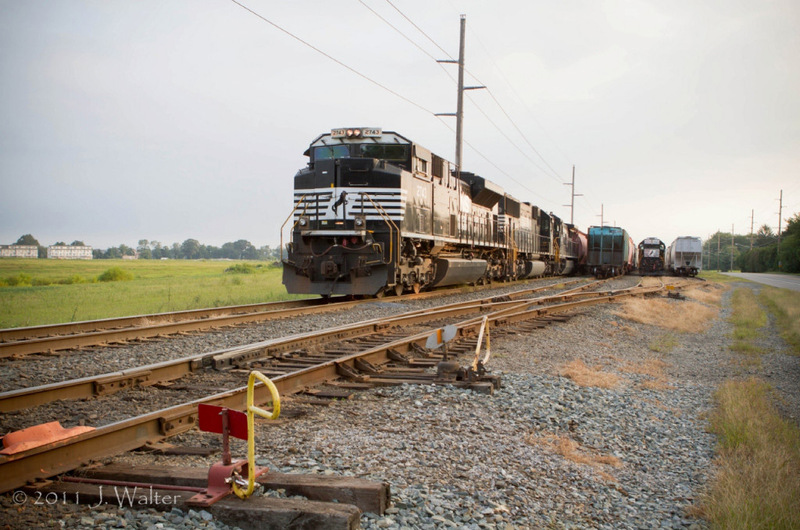 While less than 20 miles in length the corridor provided connections with the Baltimore & Ohio and Pennsylvania Railroads while offering a respectable level of freight. Unfortunately, bankruptcy still found the company in 1877 and it was later reorganized under new management as the Delaware Western Railroad (DWRR). For a time even passenger traffic was quite strong thanks to the opening of a popular resort at Brandywine Springs. The prosperous years, however, survived only until the early 1920s; in 1923 the resort closed causing a great loss of passenger business and the Great Depression ended all passenger trains after September 28, 1930. Alas, the line's biggest blow also came during the depression when the PRR elected to discontinue service to Landenberg resulting in a significant loss of freight business. As a result, the B&O cut the branch back to Southwood during the early World War II era which left a route consisting of 11.3 miles. The 1960s saw the beginnings of what later became today's popular Wilmington & Western. In 1966 the Historic Red Clay Valley, Inc., using the former W&W's name, leased part of the line to host steam-powered excursions during the weekend. This continued for about a decade until the Chessie System, a conglomerate comprising the B&O, Chesapeake & Ohio, and Western Maryland, opted to abandon the line. Fortunately, thanks to local fundraising efforts Historic Red Clay Valley was able to purchase the entire property in 1982. Since then, the W&W has steadily grown in popularity although it has experienced its own setbacks thanks to Mother Nature's wrath. Throughout the year they also host several special events.